“But, you say, he has not commanded the baptism of children, there is no reference to it in the writings or epistles of the apostles. I answer, neither has he specifically commanded the baptism of adults, nor of men or of women, so we had better not baptize anybody. But he has commanded us to baptize all Gentiles, none excepted, when he said, ‘Go and baptize all heathen in my name,’ etc. (Matt. 28 [:19]). Now children constitute a great part of the heathen. We read in Acts and the Epistles of St. Paul how whole households were baptized, and children are surely a good part of the household. So it seems that just as Christ commanded us to teach and baptize all heathen, without exception, so the apostles did, and baptized all who were in the household. Had they not overlooked that the troubling spirits would seek to differentiate between young and old, they would have considered this more expressly, since otherwise in all the Epistles they write so much about there being no respect or difference of persons among Christians. For St. John in 1 John 2 [:14] writes to the little children, that they know the Father. And, as St. Augustine writes, child baptism has come from the apostles” (LW 40:245). Quotation is from Luther’s Works, the American Edition: vol. 40, copyright © 1958 by Fortress Press. Used by permission. All rights reserved. “The children of Israel, whenever they turned to repentance, remembered above all their exodus from Egypt, and remembering turned back to God who had brought them out. Moses impressed this memory and this protection upon them many times, and David afterwards did the same. How much more ought we to remember our exodus from Egypt, and by this remembrance turn back to him who led us through the washing of regeneration [Titus 3:5], remembrance of which is commended to us for this very reason! This can be done most fittingly in the sacrament of bread and wine” (LW 36:60). Quotation from Luther’s Works is from the American Edition: vol. 36 © 1959 by Fortress Press. Used by permission. All rights reserved. The following excerpt from Luther’s 1526 Trinity Sunday sermon provides the reformer’s commentary on the new birth Christians receive through water and the Holy Spirit in the Sacrament of Holy Baptism. 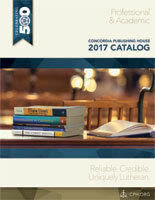 For the complete sermon, see Volume 78 of the American Edition of Luther’s Works. In his reply to Nicodemus Jesus confronts the Pharisee with the necessity of partaking in the Baptism of Jesus if one is to “see” the kingdom of God (Jn 3:3). At his Baptism the Spirit of God came down, “descending” (καταβαῖνον), that is, from above, and rested upon him (Jn 1:32). This event was “seen” by John the Baptist (τεθέαμαι, Jn 1:32; see also ἴδῃς, Jn 1:33), and this seeing brought John to recognition and confession: “This one is the Son of God” (Jn 1:34). This is the background for the response of Jesus to Nicodemus (Jn 3:3). [Read more…] about Is Baptism Necessary for Salvation?